Racing at MOONEE VALLEY with a small chance of light showers, after decent rain hit on Wednesday, as expected and as deemed required by Marty Synon and the track staff at MV. As a result, currently looking at a GOOD (4) surface. RAIL: TRUE (ENTIRE CIRCUIT). 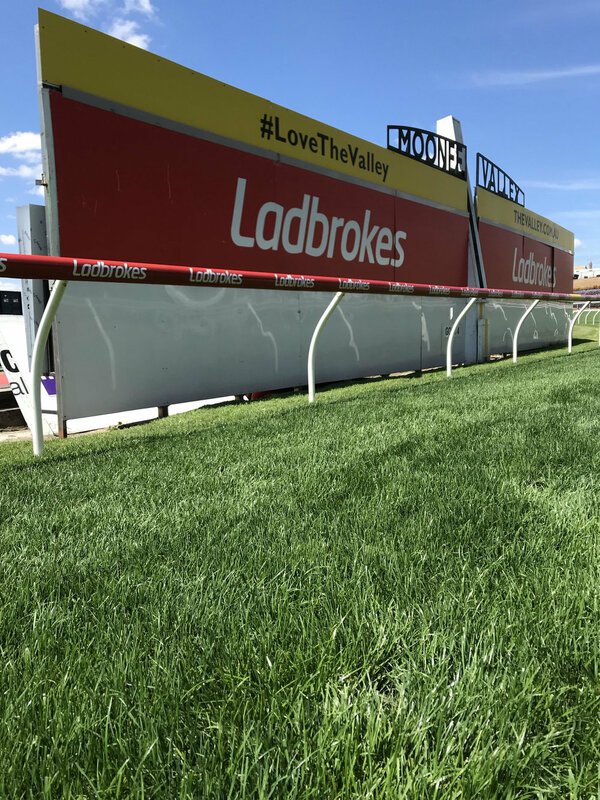 We head to MOONEE VALLEY with the rail back in the TRUE position, after being out +4M when we were last time here and we correctly identified a rail bias, especially prior to the straight. With the rail back to the true, and having walked the track this morning, expecting a relatively even track (pace dependant), but tonight in particular with strong winds evident, expecting no disadvantage to be on pace and closer to the fence. Especially, given the wind, be sure to keep a close eye on early races for best guide. Northerly wind, meaning right behind them in the straight. The staff at MVRC have the course looking a treat, now to get through 18 races within 24 hours. Race 1: We start with an open event, starting from the famous 2040m which will be the focus of attention less than 24 hours later in the big one. Even, competitive race despite the small field. Doesn’t look to be a heap of pace on paper and think that best suits LORD DURANTE at $9+ (CENTREBET). The form of LORD DURANTE looking brilliant given he wasn’t far from surprise Caulfield Cup winner Boom Time last time. Reads excellent for a race like this and will make own luck out in front. Slight concern is the northerly wind which will be in their face around the back, but only a short span, so shouldn’t be major. On a tricky night, happy to make an early BEST VALUE bet of the day/night. Throw a blanket over the rest in a very even affair. Note, no third dividend. Race 2: Next is the Chandler McLeod Country Cup handicap to be run over the mile (1600m). This is super tough. Had MASTER RESET drawn a gate, I’d be super keen, but drawn 11/11. Had there been less pace in the race, then I’d be super keen on RIB EYE, but there look to be good tempo here. As a result, instead of each way plays, going to play two here on WIN only basis’ as I’m finding it hard to split. Slight lean towards LAUGHING HEIR at $8+ (BET365, CENTREBET, UNBET) and REFULGENT at $8.50+ (CENTREBET). LAUGHING HEIR who although not brilliantly weighted (meets RIB EYE 1kg worse for 1.2L defeat), should get tempo to suit and doesn’t know how to run a bad race, having won 3, placed 6 from 7 starts in short career. While, REFULGENT looks ready to get back into the thick of things after three runs this prep. Probably would have preferred a little longer, but drops in grade from the Seymour Cup and can improve here. Happy to play there, ahead of main dangers RIB EYE, MASTER RESET and CARRAIG AONAIR first up after break for Williams / Hayes – Dabernig combination. Race 3: Next is a benchmark 84 over 1500m and pace/tactics and how track is playing set to be key, with minimal pace on paper. IMPERATOR AUGUSTUS @ $3.60+ (CENTREBET) now with Weird was super first up and in the past has been able to sit on pace, even lead just as it did last two runs in Sydney which included a win and a 2nd. A noted wet tracker, but form on top of the ground good also, especially at this level. Happy to play there, with main danger most definitely hot fave here FOX PLAY who is most definitely rock bottom odds at $2.20 with most operators. Race 4: Next is the Mitchelton Wines Handicap for the three year olds over 1000m. And there looks to be plenty of pace on paper which should setup an exciting race and finish. Although **MADEENATY** @ $4+ (most operators) can lead and be right on the pace, she has the ability and adaptability to also sit behind the pace, which may prove the race winning move here. Really like in this grade and we get a price given the barrier 9/9 and weight (60kg) but it’s there for a reason, clearly the most proven runner in the race. Happy to make a BEST VALUE bet of the day. Then, want a secondary play on KRONOS at a juicy $16+ with CENTREBET. Should be suited by the expected pace and is hopefully wound up for a run fresh, which trainer Steven Brown has a knack of doing at a price. Debut win was a $100k race in Adelaide before drawing 15/15 at Caulfield and finishing well behind before a break. Hoping they go back, but at the price, happy to take the punt regardless. Main dangers NATURE STRIP and SMART COUPE. Race 5: First leg of the quaddie is a restricted benchmark 84 over the short, sharp 955m. Competitive race, pace/tactics key with plenty of pace as you expect with these 955m affairs. Plenty of chances, but many needing luck on side, hence think the safest play is LADY ESPRIT at $5+ with CENTREBET. Maps to get a good run just behind the leading pack from barrier 3, allowing gun and in form hoop Mark Zahra to assess and peel out of trouble at the right moment at the top of the straight. Loves the somewhat unique trip, likes the track and is actually 2 wins and 5 placings from 6 starts over this particular track and distance. Been freshened for this after a couple of sub-par runs, but can bounce back in this grade. Then, also want something on ESSENCE OF TERROR each way at a juicy $11+ with UBET and POINTSBET. Drawn awkwardly but have her getting cover and out of trouble midfield and hopefully in a position to let down and come over the top of them in the straight at a good each way price. Finally, a longshot blowout play to *TINTAGEL ROCKER* who may be completely outclassed, but has smashed them in interstate provincials and at a massive $41+ (CENTREBET) happy to punt on the off chance that provincial form can stack up here. At the price happy to make a BEST LONGSHOT bet of the day. Main dangers KING’S BAY (the query runner, monitor market), REBEL MISS and PETITE’S REWARD. Race 6: Second leg of the quaddie is the Emerson Handicap over that famous 2040m start for the fillies and mares. I was at Breakfast with the Best on Tuesday morning and there was 4 x runners who got a big star against their name as catching the eye and one appears here in the form of HISTORY REPEATS. $10+ here with CROWNBET looks a solid each way price, and most importantly in good, consistent form of late. Drawn awkwardly in 12, however there doesn’t seem to be a heap of pace, so hoping Walker can cross and find a spot close to the rail and if so (assuming leaders/on pacers are given their chance, pace dependant) should be hard to catch. TOKEN OF LOVE at $15+ (BET365) doesn’t have the barrier concern (jumping from 1) which will allow Corey Brown to lead on the rail and hopefully stack them up and try and dictate terms. Am hoping we have 1-2 in the run and ideally off a slow to moderate tempo, if not we’re in trouble. Finally, something on longshot hope STORMY SHORE at $31+ with UBET. Up in grade, but should get to a good spot in the run and form is consistent, admittedly in lesser grade. Main dangers FALIKA, SEBRING DREAM and SMART AS YOU THINK. Race 7: Penultimate event is the feature, in the form of the Group 1 Manikato Stakes over 1200m and what a cracking race! Besides REDZEL and SHE WILL REIGN, we have the fastest horses in Australia assembled and given Australia is known for the best sprinters in the world, you could argue 10 of the fastest going around. You simply can’t go past the obvious here in VEGA MAGIC who surely won’t get another Craig Williams’ stinker here and from barrier 3 should lead or be right beside/behind the leader. There somewhat surprisingly doesn’t seem to be major pace for a Group 1 sprint, hence, everything points to the gelding being terribly hard to catch/beat. Primary play on a WIN only basis at $2.20+ with UBET, NEDS and BET365. As short as you would want in this field but thinking we might get better on the night. Then, the second of four who received a big asterisk against their name after catching the eye at Breakfast with the Best and that was *HEY DOC*. Worked super to the eye and the clock backed it up running last 400m in 23.26. I think they’ve worked out this gelding is a better sprinter after failing over the longer trip and like the good freshen up for a fresh run here. Not officially first up but is very good fresh, 1200m suits, is actually unbeaten at the track (2/2) and although would need a peak career performance to beat a field like this, this just might be the night *HEY DOC* makes a name for him/itself. $26+ (BET365) is a super price and happy to play that way each way, furthermore make it a BEST LONGSHOT bet of the day/night. Main dangers ROCK MAGIC, SPIETH (high class, must forgive last start, too bad to be true), IN HER TIME and SUPER CASH. Super race, doesn’t end there. There’s a grey flash that will sit at the rear who goes pretty well also, but can’t have them all in. Race 8: Final event is the Baisi Fashion Group Handicap to be run over 1200m and arguably the toughest of the night to finish off with. A stack of chances, and a stack of differing form lines and fitness levels to try and line up. Good pace and by race 8 you would think we would start seeing some sort of shift to those coming from off the pace, especially if the pace warrants as it looks to on paper here. As a result, looking at two who should settle midfield behind the hectic tempo up front, but close enough to strike and ideally out of traffic. The two in question are RUETTIGER at $8.50+ (LUXBET, CENTREBET) as well as ONEROUS first up at a juicy $21+ with CENTREBET. As mentioned both hopefully get the right run in transit, RUETTIGER hasn’t won for a while and the excuses are mounting but this suits and does drop a big 5kg from start two back when just missed behind So You Too against some rivals here. ONEROUS has won 3 from 6 first up as it is here, is a consistent type, has shown from both at the track and distance and as a result at $21+ worth the punt. Main dangers HELLOVA STREET, BASSETT, MISS GUNPOWDER, WELL SPRUNG and SUSPENSE. Tough finish. Average odds $13.99+ per suggested runner!